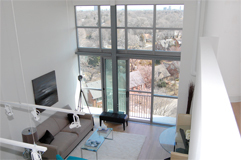 Condominium loft with 2 bedrooms, 2 dens, 2 washrooms, on 2 levels. 1 underground parking space, 1 storage locker and 6 appliances included in price. Simply spectacular. Wall to wall windows frame view of canopied trees by day, downtown lit skyline by night. Sophisticated finishes with custom touches. Large centre island in kitchen with extra tall upgraded cabinets and s/steel appliances. Upgraded Kohler lavatory sinks. 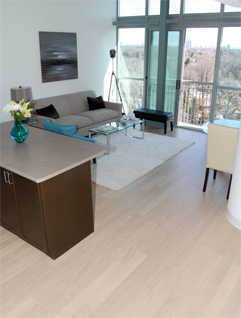 "Elegance" line of bevelled laminate floors throughout. Immaculate, spacious loft in a fantastic location. Location: Bloor & Islington. Steps to Bloor Street subway, shops, restaurants and Kenway park. 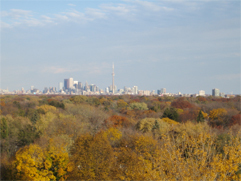 Short drive to QEW, 427, 401, 407, airport and lake. Building Amenities: 24 hour concierge, rooftop terrace, fitness centre, steam rooms, whirpool, party room, guest suite, visitor parking. Maintenance Fees: Includes heating, cooling, water, condo amenities and building insurance. For other available properties, please visit www.realtor.ca (mls.ca) or e-mail davidsonandrea@rogers.com with details of what you are looking for, so you can be sent the most current, up to date selection of available properties from our industry's internal database.